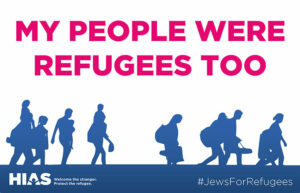 This Sunday, February 12, is the National Day of Jewish Action for Refugees. We encourage TEMV members and friends to participate and attend the Boston-area gathering at the New England Holocaust Museum. The Day of Action, with events across the country, is being organized by HIAS, an organization that is guided by Jewish values and history in its work helping refugees. TEMV recently signed onto HIAS’ Welcome Campaign as an affirmative statement in support of welcoming refugees to the United States. If you are interested in attending with other TEMV folks, please leave a comment or e-mail us and we’ll make sure to connect everyone. Please also check your e-mail for information from TEMV on other activities that may be happening.